The universal heavy-duty gasket for an extremely wide range of applications in the chemical and petrochemical industries as well as in the ship building industry for chemical tanker applications. Due to its unique load bearing properties it is able to withstand high temperatures and pressures and it is the only PTFE gasket with a Fire Safe Certificate. It is also the first choice in the food sector and in the pharmaceutical industry, for steam applications and in oxygen pipes, and where special requirements are made acc. to TA Luft (German Clean air regulation). 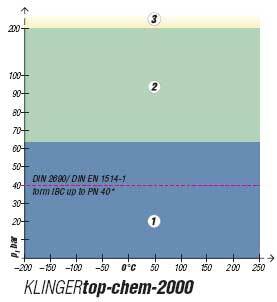 KLINGERtop-chem-2000 has excellent chemical resistance in strongly acidic and alkaline applications and offers exceptional performance in applications with high mechanical requirements at high temperatures. As regards media, the range of applications is comparable to that of KLINGERtop-chem-2000. 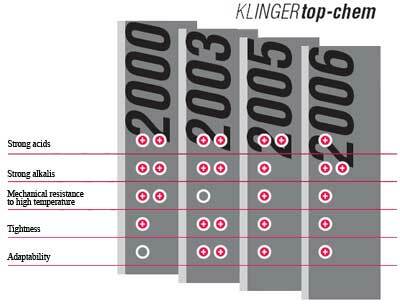 However, KLINGERtop-chem 2003 has greater compressibility and is ideal for maintaining a tight seal even at low surface loads and temperatures. 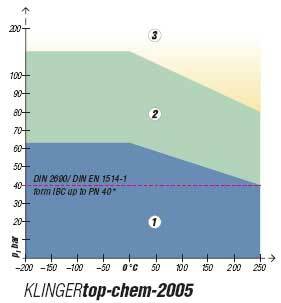 KLINGERtop-chem-2003 has excellent chemical resistance in strongly acidic and alkaline applications and excellent mechanical properties at medium and low temperatures and loads. Special mention should be given to its high gas tightness at even low surface loads (TA-Luft certification). 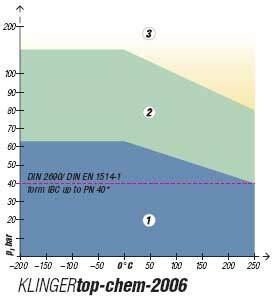 KLINGERtop-chem-2005 has excellent chemical resistance in strongly acidic applications and is suitable for a wide range of applications in the chemical industrie. It has good mechanical properties at medium and low temperatures and loads. 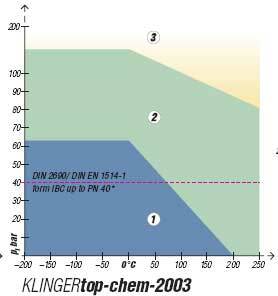 As regards media, the range of applications approaches that of KLINGERtop-chem-2000. The material is an economical alternative where requirements less stringent. and low temperatures and loads. industry. Because it is free from pigments, this material is especially suited to food and pharmaceutical applications. according to DIN 52913 and BS 7531, the gasket stress is kept constant throughout the entire test. result of a constant load is measured at a temperature of 23°C and also after heating up to 250°C. The value of the thickness decrease at 250°C relates to the thickness after compression at 23°C. Many who use static gaskets believe that the values quoted for maximum admissible temperature and maximum operating pressure are inherent properties or characteristics of gaskets and gasket materials. Unfortunately, this is not the case. 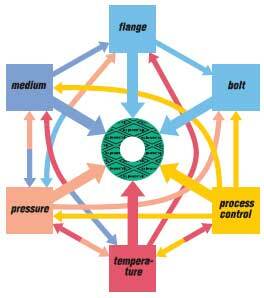 The maximum temperatures and pressures at which gaskets may be used are influenced by a large number of factors. Therefore a definite statement of these values for gaskets material is not possible. For the reasons given the pT diagram is not infallible: it serves as a rough guide for the end user who often has only the operating temperatures ad pressures to go on. Additional stresses such as greatly fluctuating load may significantly affect whether a gasket is suitable for the application. Resistance to media must be taken into account in every case. (1) If your operating temperatures and pressures fall within this field, it is not usually necessary to conduct a technical examination. (2) If your operating temperatures and pressures are within this field we recommend a technical examination. (3) If your operating temperatures and pressures are within this blank field, a technical examination should be carried out.